As mentioned earlier, CR120936 was primarily an empirical study. As the tests with the prototype Shear Coaxial Injector began, I realised I would have to conduct further research into the mechanisms of coaxial atomisation and the physical parameters governing it. Prior to examining the actual tests it would be well to look at these principles. When I took this photograph the day was perfect for making this type of observation; bright sunshine and a 30 knot wind. So much for the sea. Let us return to coaxial atomisation. In attempting to disrupt a liquid stream with a co-flowing gas stream, aerodynamic forces tend to perturb the stream. Surface tension and viscosity tend to preserve it. So it can be seen that gas and liquid stream Reynolds Number and Weber Number are important parameters. The Reynolds number of a fluid gives a measure of the ratio between aerodynamic and viscous forces. The Weber number relates aerodynamic forces to surface tension. The Weber number is particularly important when considering fluid flows where there is an interface between fluids of two different phases, i.e. a liquid and a gas. Hardalupas and Whitelaw along with Lasheras, Villermaux and Hopfinger also showed the importance of Gas/Liquid Momentum Flux Ratio, and Mass Flux Ratio. Flow direction is from left to right. Stream diameter is 2mm, comparable to that of the prototype Shear Coaxial Injector. The top photograph shows a laminar flow. Here, Re = 800, Vl = 0.4 m/s. The centre photograph shows a turbulent flow with surface asperities and wave growth well established. Here, Re = 10,000 and Vl = 5 m/s. The bottom picture shows much more turbulent flow with very well developed wave growth. Here Re = 40,000, corresponding to a Vl of 20 m/s. Kenny and Moser et al (4) showed that for coaxial shear injectors, a definite atomisation regime exists. The onset of this regime is generally acknowledged as the point at which the liquid jet is fully disintegrated at the injector face, or within a very short distance of it. This condition is important for good performance, since the existence of an intact length in the liquid jet may lead to a combustion free zone at the start of the chamber. This would effectively reduce the available L*, leading to inefficient and possibly unstable combustion. Using the definition for Aerodynamic Weber number given in Hardalupas and Whitelaw, Kenny and Moser et al defined this atomisation region to exist where We > 1000 and Liquid Re > 10,000. Looking at the photographs from Mayer above, it can be seen that the stream where Re = 40,000 has a short portion just after the orifice outlet that is undisturbed. This illustrates another important and contradictory point. Eroglu, Chigier and Farago (5) showed that intact length decreases with increasing liquid Re, up to a point, and then begins to increase. Increasing liquid Re also implies increasing Vl. It is known that shear coaxial injectors depend on the velocity difference between the gas and liquid streams. So a slower liquid velocity is desirable, at the expense of liquid Re. Lasheras, Villermaux and Hopfinger showed that as the Aerodynamic Weber number increases for similar Reynolds numbers, the crucial parameter is Momentum Flux Ratio. Obviously increasing Aerodynamic Weber number implies increasing Vg which also increases Momentum Flux Ratio. Indeed, Hopfinger and Lasheras (6) further report that the liquid stream is completely disintegrated when Momentum Flux Ratio > 10. For M > 20 however, recirculation can occur which may cause oscillation of the spray. This can also initiate combustion instabilities. Juniper and Candel demonstrate mathematically that recessing the central tube of a coaxial injector always leads to self sustaining wake like instabilities of the central stream. Clearly, these instabilities would augment the internal vortices described in Mayer, thereby enhancing the general break up mechanism. Juniper and Candel plot convective and absolute instability lines for values of h varying from 1 to 7. The graphs plot L against log10 S. The variable h is seen to be close to 1 for most coaxial injectors. This will be proved for the prototype Shear Coaxial Injector later in this exposition. To conclude, the primary mechanism of coaxial atomisation is the stripping of the stream by the initiation of Kelvin Helmholtz type instabilities on the surface of the liquid stream. These are accelerated and eventually disintegrated into droplets. These instabilities are enhanced by recessing the central liquid post, which induces a global wake mode instability. A large Aerodynamic Weber number is desirable, as is a high Momentum Flux and Mass Ratio. The Reynolds number of the liquid stream must be kept high, but not so high as to lead to an intact length at the orifice outlet. Essentially, these conditions can be satisfied by operating the unit at a high gas to liquid velocity ratio. I have tried to give as complete a picture of the mechanisms involved in coaxial shear atomisation, as well as the factors that control it, as I can. The Kelvin Helmholtz model is something of a simplification of what is an extremely complex process. In the next post we will look at the actual experiments with the prototype Shear Coaxial Injector and apply the principles outlined here to analyse its' performance. (1) Coaxial Airblast Atomisers, Hardalupas and Whitelaw, Imperial College London, 1993. (2) Break-up and atomisation of a round liquid jet by a high speed annular air jet, Lasheras, Villermaux and Hopfinger, Journal of Fluid Mechanics, 1998. (3) Coaxial atomisation of a round liquid jet in a high speed gas stream: A phenomenological study, W. O. H Mayer, Experiments in Fluids, 1994. (4) Cold Flow Testing for Liquid Propellant Rocket Injector Scaling and Throttling, Kenny, Moser et al, AIAA, 2006. 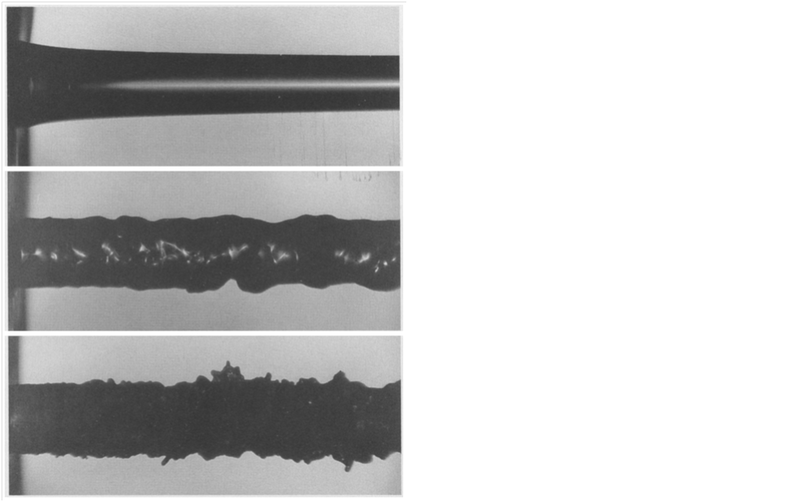 (5) Coaxial atomiser liquid intact lengths, Eroglu, Chigier and Farago, Physics of Fluids, 1990. (6) Breakup of a Water Jet in High Velocity Co-Flowing Air, Hopfinger and Lasheras, Proceedings of ICLASS 94, 1994. (7) The stability of ducted compound flows and consequences for the geometry of coaxial injectors, Juniper and Candel, Journal of Fluid Mechanics, 2003. Fascinating, as always! I check for new posts at least once a week and am following along with your work. Please keep it up as you are teaching me quite a bit that I would never learn otherwise. Thank you very much for your kind comments. I will be posting the cold flow test results soon. It is a lot of work writing everything up, and I would far rather be doing the practical work. Needless to say I appreciate the encouragement!